Autoprod / Oystar, Model F-3, inline, stainless steel (3) piston depositor. Containers per minute – depending on materials, application, environment and machine configuration. Equipped with 17" long x 12" wide x 24" deep conical product hopper and 96" long x 12" wide plastic delran container belt conveyor with 36" in feed and discharge height. (3) 1/2" ID pistons, set on 3-1/2" centers and actuator valve. Control panel has machine on / off / auto and fill volume, filler speed, conveyor on / off and conveyor variable speed control dials with e-stop. Mounted on stainless steel base frame, with casters and leveling legs. Semi-automatic, conduction heat, tray sealer, estimated speeds from 2 to 8 containers per minute – depending on materials and application. Equipped with a 7" diameter platen, serrated knife, variable timer, temperature and seal trigger controls. Film specifications: up to 9" in width on a 3" core; 8-1/2" diameter roll carrier and scrap roll carrier. Autoprod, Model FP – 1×8, automatic, inline, stainless steel cup filler and die cut heat sealer. Rated from 10 to 30 cycles or 80 to 240 cups per minute – depending on materials, application and machine configuration. Denests, fills, and heat seals pre-cut foil to cups, currently set to do 1 x 8 pattern on 3¾” centers. 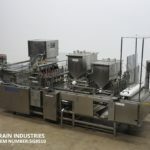 Equipped with cup denster with 21" vertical magazine, 8-head rotary valve depositor with 16" long x 30"wide x 22" deep product hopper, 8-head piston filler with positive cut off and 16" long x 30" wide x 22" deep product hopper, reciprocating pre-cut foil pic-n-place and heat-sealing section. Control panel with push button start / stop / E-stop, (8) digital temperature controllers and on / off switches for cup denest, filler 1, filler 2, lid picker, heat sealer, and heaters. Autoprod Model 2 x 4, automatic, inline, stainless steel cup filler, die cut heat sealer rated from 10 to 30 cycles or 120 to 240 cups per minute – depending on materials and application. Denests, fills, and heat seals pre-cut foil to cups, currently set to do 2 x 4 pattern on 5-1/4” centers. Equipped with dual lane cup denster, dual lane 8-head piston filler with 16" wide x 37" long x 19" deep product hopper with lift off lid and level detector, dual lane reciprocating pre-cut foil pic-n-place and dual lane heat-sealing section. Control panel with heater, heat seal, conveyor, cup and lid despence controls and e-stop. 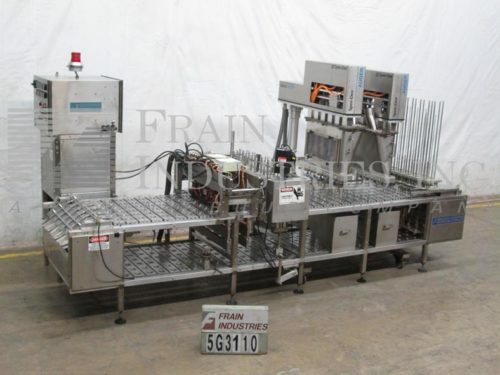 Autoprod Model FP2X6, 2 x 6 lane, automatic inline cup denester, filler, heat sealer rated from 10 to 30 cycles or 120 to 360 cups per minute – depending on materials and application. Equipped with 12 head Spee Dee servo auger filler, 2 x 6 heat sealer for pre die cut foils, all stainless steel construction . Control panel with A/B CPU controller with touch pad controls. Autoprod Model VP 2000, automatic, 8 pocket, intermittent motion, stainless steel, rotary cup filler. Container size: 1" to 3.5" in Diameter; up to 5.5" in Height. Fill range: up to 10 oz, with proper change parts. 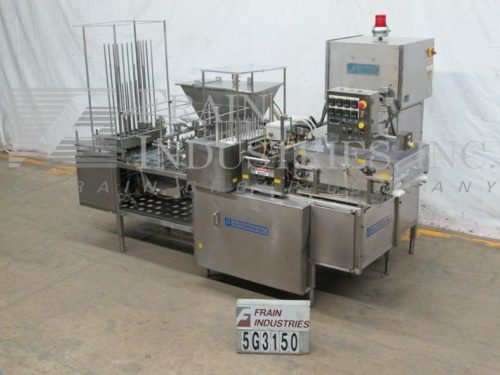 Equipped with cup denest station, piston filler, positive cut off nozzles, pre-cut foil lid magazine with pic n place, heat sealing station and reject station. Mounted on casters. Rated from 5 to 40 cpm – depending on materials, application and machine configuration. Change parts required to accommodate size / fill range. Autoprod Model 2 x 4, automatic, inline, stainless steel cup filler, die cut heat sealer rated from 10 to 30 cycles, or 120 – 240 cups per minute – depending on materials and application. Denests, fills, and pre-cut seals cups, currently set to do a 2 x 4 pattern, 5-1/4” centers. Equipped with dual lane cup denster, dual lane 8-head piston filler with product hopper, dual lane reciprocating pre-cut, foil lid pic-n-place and dual lane heat-sealing section. Control panel with heater, heat seal, conveyor, cup and lid despence controls and e-stop. Last running juice cups.